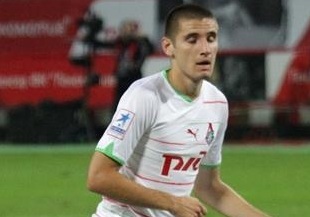 Arsenal are believed to be paying close attention to Russian defender Taras Burlak who currently plays for Lokomotive Moscow. The 21 year old defender picked up his first international cap against Cameroon in June and is believed to be one for the future with numerous clubs having already sent out scouts seeking more information on the player. This season has seen the player excel where he has gained more match time than anything previously. Although any move for the young Russian is doubtful in January it will be certainly interesting over the summer to see which club, of any will decide to bid for the player in the summer. Although Arsenal appear to be almost complete at the back, it is rumoured that the Emirates side are still looking for one more versatile player who can play in defence and someone who has experience. This would take Tara Burlak out of the equation for the time being but as with all players Arsenal tend to be interested in, the young defender is likely to attract more attention from elsewhere before too long.